Explore New Delhi's surroundings by going to Ghaziabad (Mahagun Metro Mall, Europark Mall, & more), Galaxy Mall (in Sahibabad) and Noida (The Gaming Vegas, The Great India Place, & more). Plan for a day of cool, family-friendly fun on the 15th (Tue) at Worlds of Wonder. Spend the 28th (Mon) exploring nature at Sultanpur National Park Bird Sanctuary. 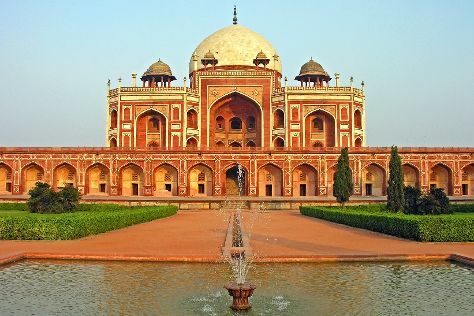 There's still lots to do: tour the pleasant surroundings at Humayun's Tomb, appreciate the extensive heritage of Lodi Gardens, let your taste buds guide you at a local gastronomic tour, and admire the striking features of Qutub Minar. To see where to stay, ratings, photos, and other tourist information, read New Delhi road trip planning site . If you are flying in from Canada, the closest major airport is Indira Gandhi International Airport. In May, daytime highs in New Delhi are 47°C, while nighttime lows are 30°C. Finish up your sightseeing early on the 14th (Thu) so you can travel back home.